Tomatoville® Gardening Forums Index > What Else Do You Grow? > Miscellaneous Edibles > growing corn ? haven't grown any corn in a long while and wondering if there were any suggestions to a successful and aesthetically pleasing crop. maybe around 50 plants, blocked in rows of 2.
going to wait until things heat up a bit more, run a string for uniformity, and poke them in the dirt 2" of so. corn used to be cheap 5c an ear, but since they started tainting the gas with corn squeezing, price has jumped to 2 or 3 for a dollar. corn has crept into Arkansas farms due to the value going up, so thought I would give it a try. sounds pretty simple, but maybe there are some useful thoughts outside of the plug and play method. 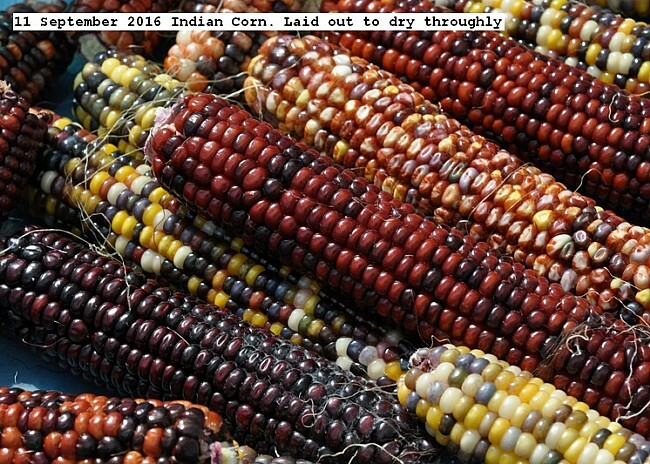 I grow about 50 plants or more of Indian corn, the colored stuff. Usually in a block with the plants about six inches apart. I soak the seeds using a paper towel until they sprout. then I carefully plant not breaking the sprout. I cover with a board raised a bit with cross pieces so when emerging the stalks have a bit of room. This is to keep moisture from evaporating due to Sun. Also to discourage birds from eating the small plants and removing the seeds. Sometimes I fence the system to discourage squirrels. I usually get around 25 pounds or dried kernels. My 8 by 8 foot patch of Indian Corn was harvested and husked today. One bushel basket was obtained. It will be thoroughly dried in the Sun and shelled and weighed. The shelled corn will be nixtamalized and made into gruel (cereal) and some used for making tortillas. Same as you,got interested after my neighbor grew some corn from Burpees called Jaws.It came in at 12 foot and multi ears to boot.One foot long ears,I love raw corn(a bite or two)almost ate the whole thing.Just as sweet as the Silver Queens we are used to. I don't know what "blocked in rows of 2" means. If you mean 2 long rows with 25 plants in each row than it is not the best way to plant corn for optimum pollination. It would be better to plant 5 short rows of 10 plants each to make a big square block. That way you have more plants spreading their pollen to each other. Each kernel of corn will require a pollen grain so you want the plants close together, not in long rows. I want to grow blue corn from Mexico. I know where to get the seeds for cheap too. The Fiesta store sells the whole ears in the international food section. Raccoons love it, and are great at sneaking under an electric fence. It's hard to keep a wire low enough to the ground to keep them out, without being so low that the grass quickly grows up into it and shorts out the fence. And I agree that planting in a square block is best. I nominate Cole Robbie for most helpful Tomatovillian. So much good advice and always answers the question! There was a whole tread here last year on the best way to grow corn in a raised bed. it seemed no one could agree. Also useful information on how deep to plant the seeds. To deep and it play out. Too shallow and it wont hold itself up. Here is the same video I posted last year. It has the machinery into play. I have always planted 6 inches apart and one foot rows for hand picking in a small space. Here is the video on how deep and why. I have grown in rows which is pretty much as easy as it gets. However, my constant need to experiment is being satisfied this year by try intense plants, 3 per square foot in an 8 x 8 bed. We'll see. Or Joseph Lofthouse's strain of Astronomy domine. or Double Red Sweet Corn. Yes, big block are best for pollination. 10ft x 10ft square. Don't use long skinny rows. Racoons are a big problem here. I have an idea for a motion detector strobe light, but haven't made one yet. I agree! But you need nominated also! I wish I had the room for it. I've tried it before, last being last year, and I crammed it in a raised bed. I only got a few ears. Silver Queen. The rest didn't grow to full size. Maybe one year when I cut down on the tomatoes....hahaha.....like that's ever going to happen!! Good luck with the corn! My son gave me some of these to try. Nice popcorn. Of course I had to try growing it. In pots no less and they were successful! Wish I had room to grow everything I want to but then I don't think I could successfully tend to it all anymore. When I had a large country garden I did grow some red corn that did well and was delicious.